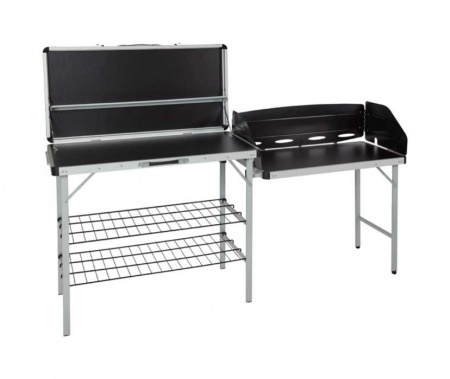 The Folding Kitchen is an essential piece of equipment made for cooking outdoors. It quickly folds flat when not in use and packs in to a storage bag, taking up minimal space. It's easy to assemble and has adjustable legs. The materials are durable and weather-resistant. The Kitchen consists of a high worktop and a smaller table for the gas stove. The main unit has a fold-down lid, hooks for utensils and a small shelf for spices or salt & pepper. There are two spacious shelves beneath the worktop, ideal for pots, plates, kettles and ingredients. There is a side table for your stove that has a windshield to stop draughts whilst cooking. 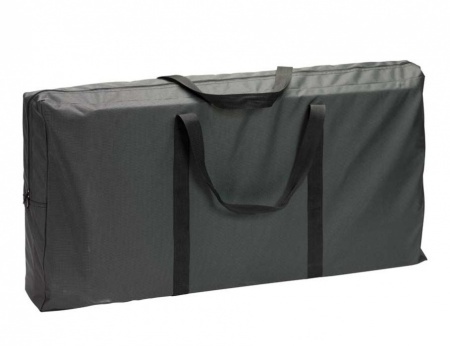 Storage: Storage bag included, folds down to take up minimal space.